A link with the past…. 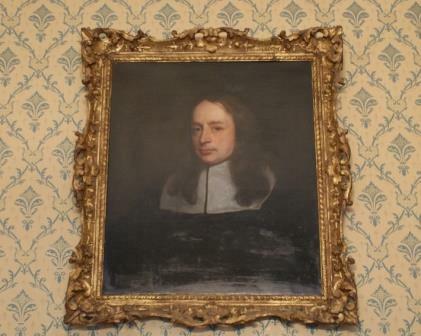 Bruno Ryves, seen here in a portrait that normally hangs in the Deanery, was Dean of Windsor from 1660 to 1677 in other words from the first year of the restoration of the monarchy. At that time the Dean also held the post of Rector of Great Haseley in Oxfordshire; in that dual capacity Bruno Ryves presented four pieces of plate to the parish church of St Peter. In recent years the plate has sat unused in a strongbox in a bank until the Parish decided to loan it to St George’s Chapel, Windsor. The plate will not be in everyday use but it will be used at Sung Eucharist on Sunday 26 January when parishioners from Great Haseley and other parishes in the benefice will attend the Service in St George’s Chapel. Alms dish with the date letter P (1672-73), no makers mark. Inscribed “In Usum Ecclesiae parochialis de Hasely in Comitatu Oxon dono dedit Brunus Ryves S Th Professor Decanus de Winsor et dictae Ecclesiae Rector”. Flagon with hinged lid; date letter M (1669-70) makers mark TH with anchor between. Inscribed “In Usum Ecclesiae Parochialis de Haseley in Comitatu Oxon Dono dedit Brunus Ryves S T P Decanus de Windsor et dicta Ecclesiae Rector”. 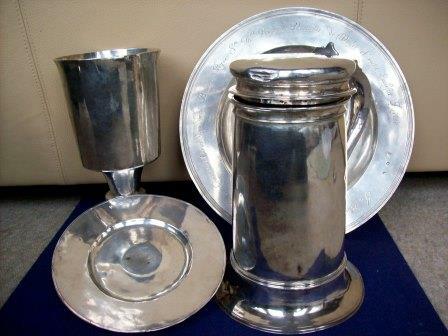 Communion Cup and Cover both with date letter L (1668-69), makers mark IN over a star and inscribed “Haseley Magna Oxon”. From the beginning of January the ‘Image of the Month’ in the Archives section of this website will explore the historic links between Great Haseley and St George’s.